Is it possible to install Ubuntu on the new Lenovo Yoga 2 Pro? I have checked the Lenovo compatibility lists on the Ubuntu site, but no new entries have been created yet for this model (released mid-October). just bought (last week) one (yoga 2 pro - i7 - 8 GB ram - 256 SSD) and have installed ubuntu 13.10. It comes with a small button on the side of the power button to enable the BIOS edit and boot sequence... When you press it, the computer powers up with the config menu. Then you have to edit the BIOS to unsecure UEFI mode. It was really easy. In order to use it without wireless, I bought the J5 usb 3.0 gigabit ethernet adapter... it works without any configuration. I found some posts online saying that they have solved this by reinstalling windows, unblocking the wireless card via software, and then going back to linux. I removed all partitions and I am not planning to reinstall windows. I started Windows and resized the Windows partition so I got 100GB free. It comes with a small button on the side of the power button to enable the BIOS edit and boot sequence... When you press it, the computer powers up with the config menu. Then you have to edit the BIOS to unsecure UEFI mode. Start Ubuntu from USB (or external CD-drive) and press "Try Ubuntu"
Alternative: use Chrome. I tested it in Chrome Version 41.0.2272.76 Ubuntu 14.10: there the touchscreen works fine as expected even pinch to zoom works fine and all menues are the correct size. leave all settings as they are but the last one, where you can chose the size. You can have this persist by adding ideapad_laptop to a blacklist, but this may remove some compatibility (although I have yet to run into these problems). I tried 12.04.3 64bit but didn't work. 13.10 64 bit worked with the above described modifications. In my case I want dual boot but the Ubuntu installer didn't detect the Windows installation so I choose "Something else" in the Ubuntu installer and created in my empty space (left space when I did my Win install) as ext4 and mount as / (root) and select this as spot to install boot. Be sure you know what you do in the "Something else" Window of the ubuntu installer. for wifi follow the above tips. (for an easier handling during install adjust the speed of the touchpad somewhat slower: Settings->"Input Devices" set "Cursor Motion"->"Acceleration Factor" to 0.02 and set the Font dpi in Settings->"Appearance"->Fonts to 250 dpi). Then I chose "Install KDE". Set the dpi in Settings->"Appearance"->Fonts to 250 dpi and log out and in again. To attach my external high resolution monitor I tried to connect Crossover High Res. Monitor to Intel HD Graphics 4400 , but the monitor doesn't work yet. Where can I customize window sizes of Notifications in KDE? How do I change the icon size in the KDE status bar? How can I zoom one specific window in KDE? 13. Finally after some days the window decorations in KDE were all gone! And I couldn't configure them back. So I decided to apt-get install ubuntu-desktop ;P.
Select "Erase Disk and Install Ubuntu" ... But then oops... Installer Crashed! "Installer encountered error with copying files to harddisk". It goes on and boots into Live session. Hmmm.. a. I try same on USB 3.0 port; same problem b. I check the downloaded iso with the md5sum, that is ok c. I steal a different USB from my wife and try again..fingers crossed... yes!... It's installing.. If you buy a yoga 2 pro, be aware of the display resolution of 3200x1800! Gnome, KDE and Xfce are not yet ready for such crazy resolutions. The only workaround for me was to lower the resolution to full hd, so the text was still readable. I'm running Ubuntu 13.10 on my Yoga 2 Pro. I think it's great! Battery life is 6+ hours. The yellow colors are a bit off, but it doesn't much bother me; the recent BIOS fix does not fix the color in Ubuntu. I have done a few things in addition to what's already been mentioned. Ubuntu is happily booting in UEFI, and I can dual boot Windows 8.1 through Grub. Turn off the computer and turn in back on using the novo button. Select USB boot from the menu. Note: I use the Ubuntu Server installation to get full support for disk encryption, I then install the kubuntu-desktop package as well as various programs I like to use, to bring it up to a normal desktop. These instructions should work just as well with the normal Kubuntu installer if you don't want disk encryption (I've found the Kubuntu installer's disk encryption support very flakey). It seems Kmix defaults to controlling the HDMI audio device volume, not the inbuilt speakers/headphones device. To fix this, so you can use those very convenient volume buttons on the side of the laptop: Run Pulse Audio Volume Control (apt-get install pavucontrol) and under 'Output Devices' click 'Set as fallback' on 'Build in Audio Digital Stereo(HDMI)'. In Firefox in about:config set layout.css.devPixelsPerPx set to 1.3 and install the add-on "Fix for zoomed default-font"
A fix for Ubuntu kernel bug https://bugs.launchpad.net/ubuntu/+source/linux/+bug/1349572 was released in the package linux-image 3.13.0-36.63 (which is in the normal Ubuntu updates) in late September 2014. In my experience this has led to less Wifi instability, although it will occaisionally 'pause' for a few seconds, which is odd. The touchscreen seems to only work as a simple mouse device - moving the cursor and clicking things works, but nothing like 2-finger scrolling or any gestures or swipes. If anyone knows how to improve this please post an answer. choose "Legacy Boot" and "Legacy First"
Start Ubuntu from USB (or external CD-drive) and press "Try Ubuntu". I installed from an USB-stick, created with UNetbootin. Optional enlarge fonts in this trial mode too before you start (like in §4) if you dislike the small font during installation. Download the Widepanel Appearance and select this in Settings Manager->"Appearance"
xfconf-query -c xsettings -p /Gtk/IconSizes -s "gtk-large-toolbar=32,32:gtk-small-toolbar=24,24:gtk-menu=32,32:gtk-dialog=88,88:gtk-button=32,32:gtk-dnd=32,32"
If you enable natural scrolling for your touchpad in "Settings" (xfce4-settings-manager)->"Mouse and Touchpad", you need to set "Enable horizontal scrolling" there too and fix the horizontal scrolling direction with How to enable natural scrolling in xfce4? enable palm detection with syndaemon -i 1 -K -R -d in "Settings"->"Session and Startup"
I just bought one yesterday and can confirm that the hardware works flawlessly if you follow the suggestions on this page. Also Standby works out of the box. 1.) Use a lower Resolution and have the display interpolate everything. Works great, but makes everything blurry. If you just buy a Full-HD 13" Laptop rather than setting a low resolution on a Quad HD notebook, you end up having a cripser image. So why spend the extra $$ just to get a worse result? 2.) I usually run Xubuntu with xfce, but i have tried Unity and KDE as well and it is the same story with all of them: Increase Font DPI, use a High-DPI theme like TGC-Huge or Husky, increase Icon sizes, increase launch-bar size etc. : this gives you finally a readable and sharp appearance, but it totally messes up the appearance of different applications. One major issue is, that the default window size of a newly launched application is still the same as with the small icons and fonts, so in GIMP for example, you have to manually resize the window to see the full menu bar, also, the tool icons in GIMP are still tiny. Firefox needs an extra setting to scale up webpages, but that should work okay, Gnumeric shows tiny cells and they increase in size once you write something into them as the font is now huge compared to the cell size.. this messes up your sheets. the overall appearance just doesn't look right anymore and there is something wrong with almost every application. So for me the decision is clear, i will return the laptop and get a cheaper Full-HD one which provides more desktop area to work with but is still readable and proportionally correct. I really hope that the missing High-DPI support will be added to our favourite Window Managers and the X-Servers soon. I used PowerTOP to analyze and reduce battery power consumption on my Yoga 2 Pro. Here are the steps to automatically apply the optimizations. You cannot enable the "Disable While Typing" clickpad/touchpad feature in Ubnutu. This is the main reason why the we have so much trouble with the clickpad/touchpad although there are other aggravating issues. This is a bug in the Unity Settings Daemon with an easy fix which will significantly improve your quality of life. 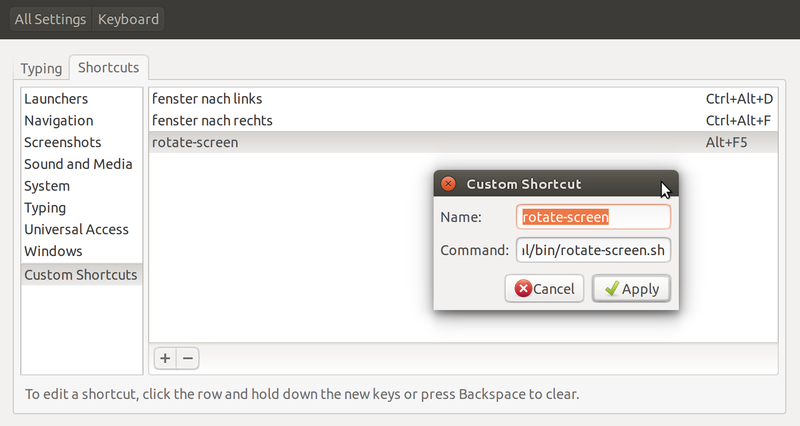 Ubuntu uses syndaemon (not synclient) to set the “disable while typing” feature on the clickpad. The only function of syndaemon is “a program that monitors keyboard activity and disables the touchpad when the keyboard is being used”. This feature is broke due to and old bug since Ubuntu 12.04 that affects the clickpad/touchpad of all users whose laptop has this feature. There is a little bug in the unimportant syndaemon -t argument which crashes syndaemon. It can be fixed by a workaround of simply not using this argument. The unity-settings-daemon configuration uses this dysfunctional argument which then disables syndaemon. This bug fix is not implemented in the unity-settings-daemon apparently because of an oversight. Syndaemon is not running when Ubuntu boots and if you simply go into the terminal and type the following “magic command” it will bring “disable while typing” back to life. It is configurable where “1” is the number of seconds it takes to enable the touchpad after typing has stopped. The optimum setting depends on your preferences which I think are related to your typing speed. I tried 2 and 4 seconds which I think were way too long and I like the 1 second the best. Someone said that you should make sure the “disable while typing” check box is unchecked in the mouse settings. Go to “Startup Applications” and add a new preference that I called “disable clickpad while typing”. Then copy and paste the above command into the Command box and save it. Now it will start on boot. It is truly amazing what this command will do for you. The clickpad/touchpad should be centered on the keyboard (between G&H) but is placed in the center of the deck likely for design purposes. The clickpad is also very large and this all leads to the right edge of the clickpad pushing out a whole key to the right of the space bar. The clickpad is also flush and not recessed making it easier to touch accidentally. Because of all this, it is impossible to work without accidentally touching the clickpad with your right palm which moves the arrow / insert bar all over the place. This makes the Synaptics PalmDetect function very important and synclient allows you to enable and configure it. However, PalmDetect is broke in the Yoga 2 Pro. There is a known issue for some clickpad/touchpads because of a kernel bug that causes the palm width to always be reported as 0. This is apparently what breaks palm detection in the Yoga 2 Pro. The synaptics package can be patched to use only Z for palm detection as a workaround. These patches are a bit beyond my capabilities so I haven't tried them. Having said that, fixing the "disable while typing" and using synclient to FingerHigh/FingerLow and MinSpeed/MaxSpeed to appropriate values has made a tremendous difference in the clickpad/trackpad usability. The usability is now markedly improved and acceptable even without PalmDetect. Even so, if someone is able to figure out how to apply this patch to this laptop, please show us how to do it in simple steps. Hopefully, the kernel will be fixed in new releases. I think it would be interesting to use synclient to inactivate the right hand centimeter of the touchpad/trackpad where most of the palm contact occurs. I did some few experiments with this but they were not successful. It would be helpful if someone who understands this better would come up with something to test. This is a great question, thank you everyone. @rubo77 has a super post. @ttomv echos my experience using a 14.10 install on my new Yoga Pro 2 purchased in 12/14. The stock kernel on 14.10 has been fixed, the WiFi problems are gone, and it now works out of the box. No more monkey business. We can now go back to focusing on tweaks. I followed a different tack when I installed Ubuntu. The 256G SSD is smaller than I'm used to with a hard drive. To me, it is pretty small and I would have to share the 256G between two operating systems with a dual boot. I experimented with installing Ubuntu to an external data device. My intention was to use this external data card as an extension of the 256G SSD. 64G SDcards / USB sticks are now readily available and reachable in price. If I could get it to work it would increase my functional memory to 256 + 64 = 320G. In my mind, it was sort of like adding a 64G partition to the 256G SSD. To install to an external device you need to choose "Install Ubuntu" and then "Something Else". This process is not unusually complex but be sure you research it well because there are some potential pit falls and the process is not particularly intuitive. You want to be sure to configure it so it installs to the external data device and also installs GRUB on the external device (not on the internal SSD). Set the mount point to "/". So I happen to have a 64G SDcard and I put it into the card reader slot (USB 2.0) to see how well it would work. The SDcard in the reader worked just fine and Ubuntu came to life. Maybe through naivety, I did not touch the BIOS. I left Secure Boot and Fast Boot enabled. After installing Ubuntu on the jump drive, it showed up as UEFI. However, it was slow when it was reading / writing to the SDcard but otherwise very fast (presumably when using RAM). So I figured I was onto something. I found that the right hand USB port is the USB 3.0 port and I researched fast USB 3.0 jump drives. I settled on the following tiny unit and ordered it waiting the obligatory week for it to arrive. So... It works... I now have 320G of drive space... I don't know if it is as fast as the internal SSD but it is wicked fast. Booting it has some idiosyncrasies. When you boot into GRUB and let it sit on the default Ubuntu option, it locks on a dark backlit screen most of the time but occasionally works as it should and boots into Ubuntu. The work around is to go to the next line in GRUB "Advanced Options for Ubuntu", accept with enter, and then accept the top option to manually boot into Ubuntu. I also find that it occasionally looses its theme (Radiance is my choice) and drops back to the default theme (Ambiance). This usually happens if I have been messing around in the BIOS and booting options and not when I have done a normal shut off and a normal boot. One or two reboots and it comes back. I do not know if both of these issues are related to the jump drive install or also occur on a regular install. I'd be interested if anyone has any thoughts on these little idiosyncrasies and how to solve them. I have some other very useful tweaks but this post is already too long so I'll break them up by topic. I also want to be able to access the SSD from Ubuntu. If Windows is hibernated you can't read the drive from Ubuntu. There is something called "Windows Fast Startup" that is a scaled down form of hibernate making for a quicker boot of Windows. However, it stores NTSF partition data in a file and locks up the SSD so Ubuntu can't access it. This is easy to fix by disabling it in Windows. This allows me to have a data directory on the SSD accessible from either the Ubuntu or the Windows 8 side. The price is that Windows boots a little more slowly. It's worth it to me. The pressure sensitivity is too low meaning that it responds to a touch with the slightest pressure. You need to make it so it requires more pressure to give a response so it is not always jumping with unintended brushes. I pushed it up as high as it would go before it started missing my normal finger touches. This is almost double the default which is set way too low. This setting has a bug. If you set these values using synclient you will find exactly what you set when you use synclient to list all the settings. However, if you set the same command using 50-synaptics.conf then synclient will always return a ratio with MinSpeed = 1 and MaxSpeed something more than that. The default is 1 and 1.75 but you don't know really what numbers created this ratio meaning you don't really know what is the default. Through trial and error I found a speed which worked well for me even in high resolution. When I use the configuration file to set new settings, synclient returns 1 and 2.25 but it seems the settings you set in 50-synaptics.conf are correctly rendered despite the values not being right. It's odd. Brushes of the clickpad/trackpad kept being intrepreted as two finger clicks and the right click dialog box was always popping up and slowing me down. Since I can right click at the bottom right, I found this more annoying than helpful. I disabled it and was much more happy. I prefer 2 finger vertical and horizontal scrolling and not to have edge scrolling enabled at all. To accomplish this with the system defaults after the GNOME defaults were disabled (as in the above post}, I needed the following commands. Below is my 50-synaptics.conf file with these changes. I hope my annotations are more understandable. The arrow and cursor wanders and jumps unexpectedly making it nearly unusable out of the box. Besides the "Clickpad Disable While Typing" above, all the other settings are controlled by the Xorg server. It is my understanding that Xorg is replacing Xinput. Ideally we should be able to use apps like "Mouse and Touchpad" in system settings to make Xorg settings, but they are sub-functional with limited options and just not useful. The method of configuration of synclient for the clickpad/touchpad is through the Xorg server configuration file called 50-synaptics.donf. This file lets you configure all the settings found in synclient. Don't forget that any given clickpad/touchpad may not have every function found in synclient so that is why some settings don't work. After installation of xf86-input-synaptics, a default Xorg configuration file is installed at this location. Below are links to information on synclient settings. You can over-ride the default settings with another 50-synaptics.conf file placed in a different location. It is common to copy the default file into this location and then modify the default file as a good starting point. This directory and file do not exist and you have to create the directory and past the default file there. This file is to be placed into this location. There is another issue in that the GNOME settings daemon can over-ride both of these configuration files. You can disable the GNOME settings daemon for the mouse/touchpad properties with the dconf-editor. Go go to org > gnome > settings-daemon > plugins > mouse and dismiss the active option. Now the new 50-synaptics.conf is at the top level and should not be overridden. The side effect is that you can no longer use "Mouse and Touchpad" settings under System > Preferences > Mouse but this is actually good because it is useless anyway. GNOME settings are user defined so if you have a second user you need to set this for that user as well. When you create the new directories and create or modify the new file for 50-synaptics.conf, remember to open gedit as superuser in the terminal. Open Nautilus the same way. If you screw up making changes to 50-synaptics.conf you will find Ubuntu unforgiving and it will not boot. You can go into recovery mode and first do "network" to get into read/write and then use "root" which brings you to the terminal. You can use the mv Linux command to rename your file to something different (e.g. add bak at the end). Then your computer will reboot using the default configuration file. You will save the day and you can then use gedit and find out where you went wrong and fix your mistake. As I was experimenting this happened to me several times. You will have a lot more fun if you change the GRUB resolution before you start messing around so you can read what you type. Synclient will return all the settings by simply typing synclient into the command line. I recommend you create a word processor document and copy theses settings. Do a copy of the installation default before you make any of changes. Make another copy after you have disabled the GNOME settings. Then, make a final copy after you have made your last settings. It is usual to use synclient from the command line to experiment and test settings until you find what you think is best. Then finalized them into 50-synaptics.conf. Now you have the tools to configure your mouse. The screen defaults to full brightness which is unnecessary and is a battery killer. You can change the default brightness to a more appropriate 50%. Install xbacklight with Synaptic Package Manager which is a command line program to set the “back light” or screen brightness level. The following command line entry will set the screen to 50% brightness and if you put this command in the startup applications it will boot at 50% rather than 100%. Increasing the Unity Launcher Bar “reveal sensitivity” makes opening it by bumping the left side of the screen more usable. Move slider to about 50% (if the default line on the slider is 0%). I just discovered this setting by accident. My preference is also for the “legacy” arrangement of the hotkeys where the default across the top row of keys is the function keys (F2 etc) and holding down the Fn key executes the Hotkey (such as screen brighness). This way you can get into the BIOS by booting and hitting F2 rather than Fn-F2 in the usual way. Disable the Hotkey Mode. The default resolution is 3200 x 1800 (16:9). Set the screen resolution to the the next lowest setting with the same aspect ratio which is 1920 x 1080 (16:9) This gives you excellent screen sharpness and is is still amazingly high resolution. This is just the easiest way to deal with it. These settings hold through reboots. You can then continue to play with how to use the higher resolution if you want. The GRUB resolution is so high that you can hardly read it. I got the idea to change it earlier in this thread but it turns out that GRUB does not support every resolution. After a bit of trial and error I found that 1280x1024 worked and was pleasantly sized to match the screen and seem like it matched the reduced resolution I chose. This is way more important than you might think. Lenovo generally works fine, so go ahead and give it a try. I assume you're asking this before you buy it. If so, you'll probably be able to return it within a few weeks if it doesn't work. So go ahead. The only thing you might have problems with is UEFI secure boot. I'll add my experience as well. As this was the first time dual booting with UEFI, I wasn't as familiar with how to setup grub and such. My experience was Ubuntu "got it right" without too much trouble. I didn't change anything in the BIOS, I adjusted the drive size from Windows, then rebooted into the live USB, and when partitioning came up, selected "Something else" and created a /boot and a / partition. Thats it, I didn't mess with any existing partitions and the yoga worked great. Now I can use grub to select windows or (default) boot Ubuntu, but also, I can use the Novo button to select Windows if you so desire as well. Just thought I would put it out there for those who wondered how much work was involved in keeping Windows with Linux, answer: not much. I'll just second the blacklisting of ideapad-laptop and the acpi_backlight=vendor boot option as good "basics." Also, Unity is handling the resolution better than I even expected.How to find and change the screen DPI? is a great framework to find your preferred DPI settings. I had to play with it a little bit but found a good setting I can live with. By the way, I uses 277 and my DPI setting and text-scaling-factor as 1.6 but that is just my preference, I like small text! Not the answer you're looking for? Browse other questions tagged system-installation yoga-2 or ask your own question. How to find and change the screen DPI? How do I set a shortcut to screenshot a selected area? How to disable all scopes, filters and dash plugins? installing Ubuntu on Lenovo yoga 2 13"